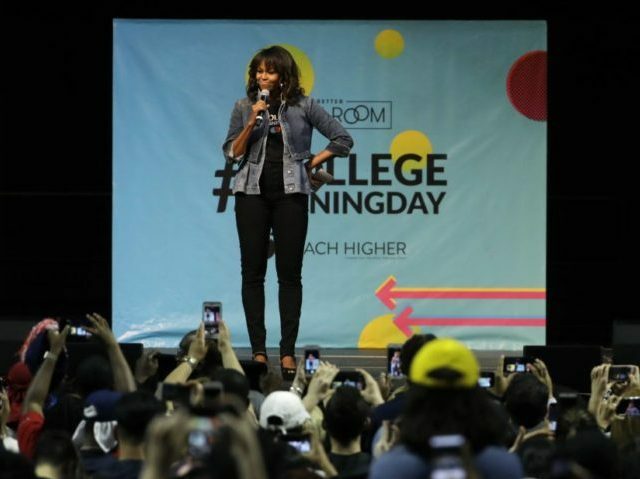 Former First Lady Michelle Obama described herself as America’s “forever First Lady” on Wednesday as she addressed a crowd of high school students at a College Signing Day in Philadelphia. “I know you are me, and if I can be standing here as your forever first lady, then you can do anything you put your mind to,” she continued drawing huge applause from the audience. It is now the fifth consecutive year that Obama has celebrated a College Signing Day event, which celebrates students who decide to go to college. Other celebrity guests were also in attendance, including Robert DeNiro, Zendaya, Camila Cabello, Rebel Wilson and Bradley Cooper. According to polling, Michelle Obama remains the most popular White House from her husband’s tenure in the White House, scoring a higher approval rating than her husband and Vice President Joe Biden at around 68 percent.